If you asked people in the street to name three new books, films, TV shows or music they’ve enjoyed in the past 20 years, you’ll soon have hundreds of different answers. Ask them to name three boardgames, and you will likely only hear “Monopoly, Scrabble & Cluedo” (aka Clue)*. Not an exaggeration, most people have no idea how far boardgame design has progressed recently. Modern boardgames compare to Monopoly like a BMW compares to a Model T Ford. It’s that different. I was shown Settlers Of Catan in 1996, just after it was first published and it changed my life**. The epitome of modern German game design, Settlers is totally engaging. You have to think, make decisions, barter, trade and influence the other players. You don’t attack people, but you can block them. You don’t get eliminated and the game takes about two hours tops. Settlers does use dice, but you win by being smart, not lucky. The ‘board’ is modular, large hex tiles, so every game is different and fresh. 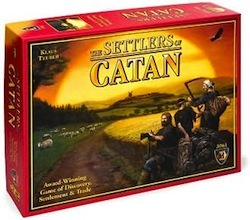 Settlers Of Catan won the Spieles des Jahres (SdJ) in 1995, the highly prestigious jury prize, and has gone on to sell millions of copies with many expansions & variants. More importantly, the SdJ stimulates game designers and publishers to constantly strive for high quality, novel, easy and fun family games. Today, the market has expanded rapidly through Europe and now ‘eurogames’, as we call them, come from all around the world. Should you buy a copy of Catan? Nope, not right away. I suggest you do some research on the game***, ask around, find one to play. Maybe you’ll love it, maybe not. You might prefer Carcassonne, or Ticket To Ride, Power Grid, Pandemic, Hey! That’s My Fish,Niagara or Manhattan. There are hundreds upon hundreds of fascinating, easy, quick games you’ve never heard of. But at least you’ll discover there is life after Monopoly. *** I recommend you check out the previously reviewed Board Game Geek for more info.